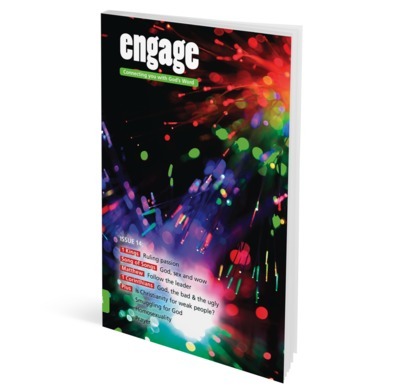 Issue 14 of Engage looks at 1 Kings, Song of Songs, Matthew and 1 Corinthians. Issue 14 of Engage - daily Bible reading notes for teenagers. This issue looks at 1 Kings, Song of Songs, Matthew and 1 Corinthians. There are also articles on Is Christianity for weak people?, Smuggling for God, Homosexuality and Prayer. • Is Christianity for weak people? Bought these for young people in church. They are proving very helpful for studying bible by themselves. Older members of the congregation are also enjoying them as they go book by book through the Bible. The only negative would be some font colors make reading difficult for older people eg peach font resembled white too closely. That’s only reason I’ve put a 4.